German Alto gemshorn. The gemshorn was in use in the 15th century (there exists an organ stop of that name) and was primarily a pastoral instrument, not widely known after the mid-to-late 1500s until the resurgent interest in early music in the 20th century. 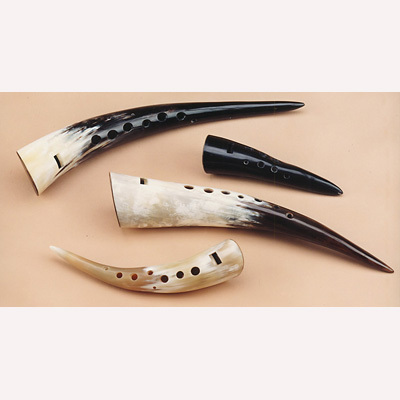 The Gemshorn is an early form of recorder, made of a cow horn with a fipple inserted at the wide end. It has an incredibly sweet sound due to the conical shape of the horn and has a range of one octave. The name comes from the German "chamois" horn, but the early history not well known, the oldest known illustration of one being seen in Musica Getutscht (1511), by Virdung. These high quality Gemshorns are made in Germany.